I’ve always been told ever since I was tiny that breakfast is one of the most important meals of the day. It fuels you for the day, gets you going. However it only really gives you fuel for the day if it isn’t a bowl full of sugar. Thats why I’ve started trying and testing porridge. Also this is a kind of mental note to myself to eat more porridge and stop with that chocolate crunchy nut haha! So first of all, what are the health benefits of porridge itself? According to Harvard University, eating whole grains such as oats is key to living longer. Porridge is a slow energy release ‘meal’ which means you won’t be craving a chocolate bar about an hour after eating it. Alongside this, it helps to boost your energy levels and keeps you going for a longer period of time. There are many other benefits that come along with porridge, such as immunity boosting, muscle recovery etc. So whats not to love? The porridge I use is from a packet, you empty the oats into a bowl, add milk and microwave for 2 minutes. Which is really quick and easy. Its plain porridge because flavoured ones can contain high amounts of sugar, which defeats the object. I don’t really like it on its own, bit boring. So I add in quite a lot of cinnamon and mix it in. After I cut up a whole (small) banana and add that on top. 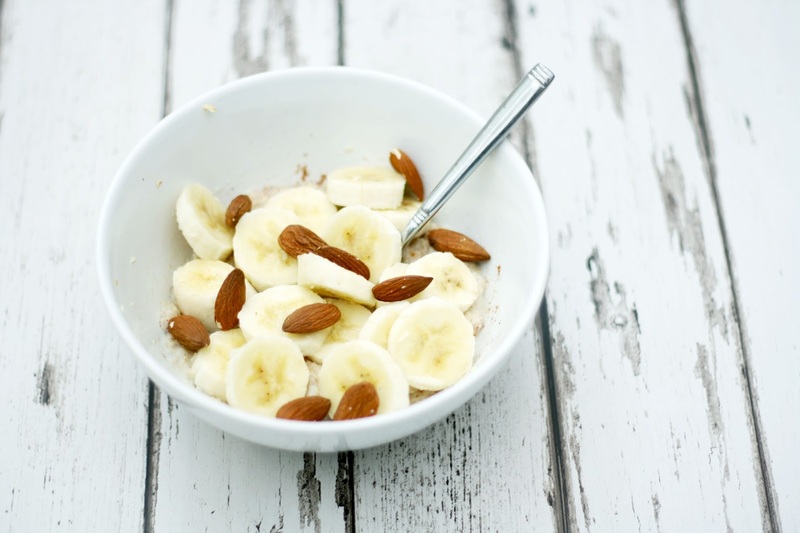 Banana tastes so good with porridge, trust me! To top it off I add some almonds on top of that, because they’re very good for you. And voila, you have a super healthy breakfast that will keep you full for a good few hours! I can also say this does taste really good, even if its appearance doesn’t look the best haha!